ETS C1D2 Information – Welcome to the EMIT Technical Forum! This apparatus is suitable for use in Class 1, Division 2, Groups A, B, C & D, or unclassified locations. Cet appareil convient pour une utilisation en Classe 1, Division 2, les emplacements Groupes A, B, C & D ou non classifiés. Other than the ICM1 or ICM2 modules, the ETS modules (AFRCA, AFRCL, EMD, GOV, Annunciator, AEM) must be installed in a C1D2-suitable enclosure that is IP54 rated or better, and protects the module from being accessed in normal operation without using a tool. The enclosure should suitably protect the equipment from deterioration that would affect its suitability for Class I, Division 2 locations. 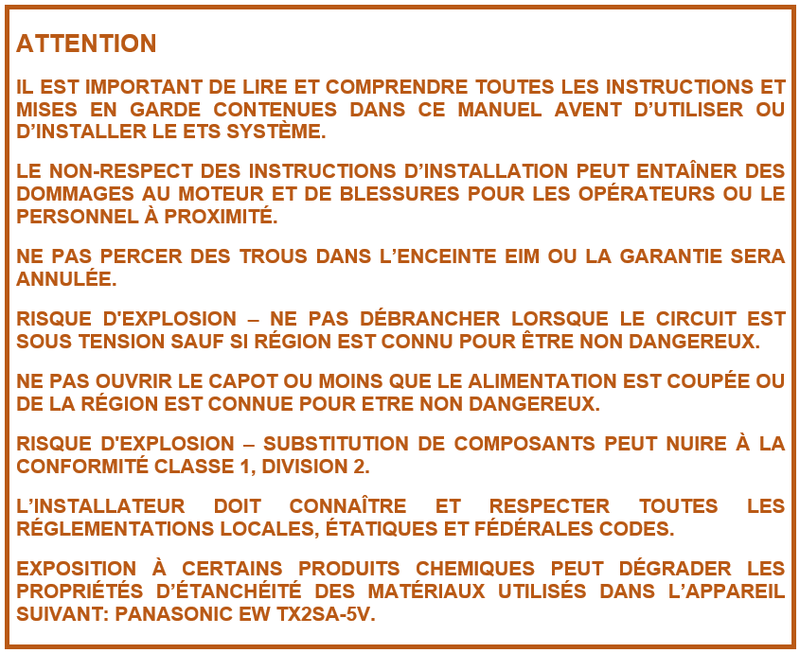 Outre les modules ICM1 ou ICM2, les modules ETS (AFRCA, AFRCL, EMD, GOV, annonciateur, AEM) doivent être installés dans une enceinte adaptée au C1D2 de classe IP54 ou supérieure et protègent le module contre l'accès en fonctionnement normal Sans utiliser d'outil. L'armoire devrait protéger adéquatement l'équipement contre toute détérioration qui aurait une incidence sur son aptitude aux emplacements de Classe I, Division 2. Since each customer’s installation and engine requirements differ, the components typically included in the ETS kits are designed for the simplest field installation and do not comply with necessarily all the standards required for Class 1 Division 2 environments. If the installation must meet Class 1 Division 2, EMIT Technologies can provide kit components that comply with these environment requirements. 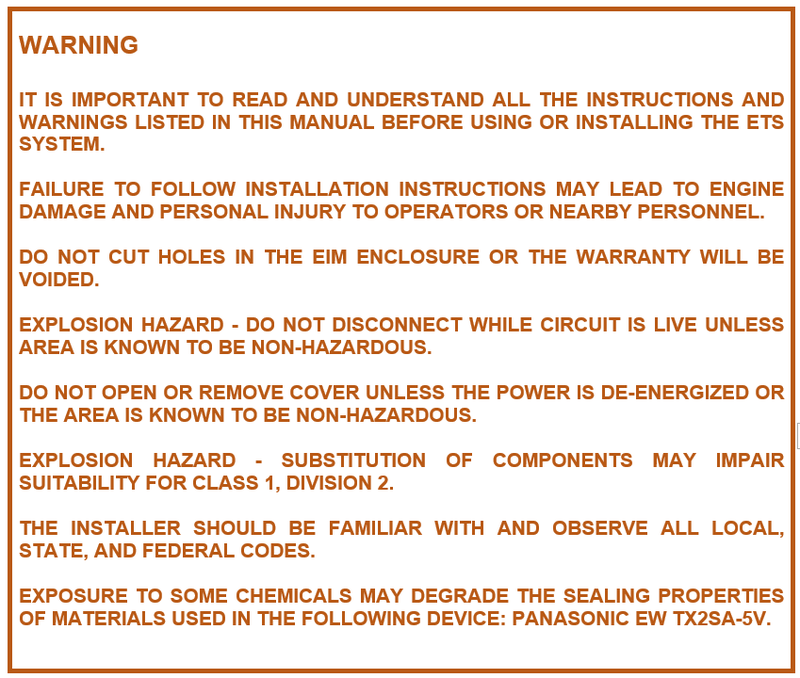 Wiring of Class 1 Division 2 end devices requires that wiring be enclosed within approved conduit and wiring connections be completed within approved conduit outlet boxes or enclosures to maintain the IP 54 rating of the device. End device pigtail to wiring harness guide is below. 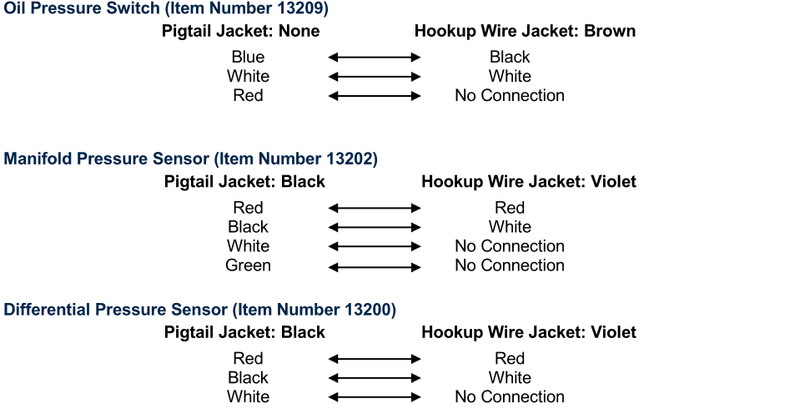 Note: Isolate and secure the “No Connection” wires of the sensors so that it does not contact any other electrical connections or conductive surfaces.